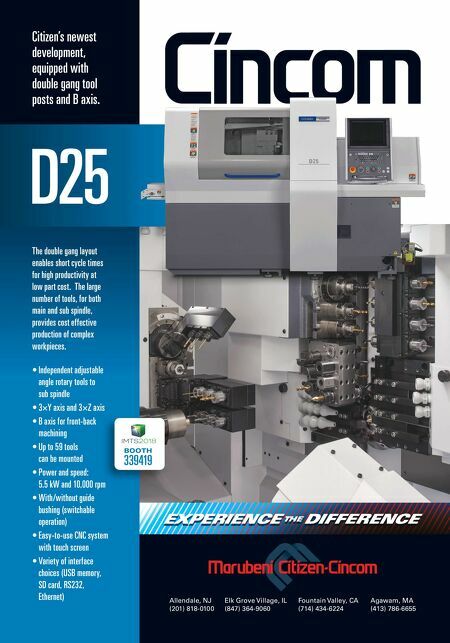 COMPETING IDEAS MMS AUGUST 2018 30 mmsonline.com Manufacturing Management AUTHOR | Wayne S. Chaneski Executive Director, Center for Manufacturing Systems New Jersey Institute of Technology REQUEST A QUOTE TODAY! Alpha Workholding is the premier American manufacturer of Permanent Electro Magnetic workholding and material handling products. Available in 5 sizes, Eagle-Lift Magnets are built to the highest standards of workmanship, and boast unsurpassed performance and safety in the workplace. 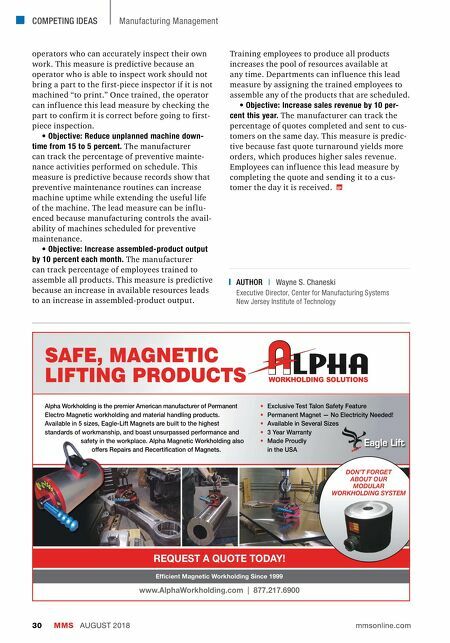 Alpha Magnetic Workholding also offers Repairs and Recertification of Magnets. • Exclusive Test Talon Safety Feature • Permanent Magnet — No Electricity Needed! • Available in Several Sizes • 3 Year Warranty • Made Proudly in the USA SAFE, MAGNETIC LIFTING PRODUCTS www.AlphaWorkholding.com | 877.217.6900 DON'T FORGET ABOUT OUR MODULAR WORKHOLDING SYSTEM SAFE, MAGNETIC LIFTING PRODUCTS WORKHOLDING SOLUTIONS Efficient Magnetic Workholding Since 1999 operators who can accurately inspect their own work. This measure is predictive because an operator who is able to inspect work should not bring a part to the first-piece inspector if it is not machined "to print." Once trained, the operator can inf luence this lead measure by checking the part to confirm it is correct before going to first- piece inspection. • Objective: Reduce unplanned machine down- time from 15 to 5 percent. The manufacturer can track the percentage of preventive mainte- nance activities performed on schedule. This measure is predictive because records show that preventive maintenance routines can increase machine uptime while extending the useful life of the machine. The lead measure can be inf lu- enced because manufacturing controls the avail- ability of machines scheduled for preventive maintenance. • Objective: Increase assembled-product output by 10 percent each month. The manufacturer can track percentage of employees trained to assemble all products. This measure is predictive because an increase in available resources leads to an increase in assembled-product output. Training employees to produce all products increases the pool of resources available at any time. Departments can inf luence this lead measure by assigning the trained employees to assemble any of the products that are scheduled. • Objective: Increase sales revenue by 10 per- cent this year. The manufacturer can track the percentage of quotes completed and sent to cus- tomers on the same day. This measure is predic- tive because fast quote turnaround yields more orders, which produces higher sales revenue. Employees can inf luence this lead measure by completing the quote and sending it to a cus- tomer the day it is received.